From Left: Timothy Barner, son of Rev. Dr. Paul M. Barner '82; Daquetta P. Jones '02; Andrew Larson '93; and Clifton "Cliff" Perez '79. The Hudson Valley Community College Foundation's annual Distinguished Alumni Awards Brunch was held Saturday, Sept. 22 in the college’s Bulmer Telecommunications Center meeting rooms. The program celebrates alumni for notable contributions within their career fields and communities. This year’s honorees included Clifton "Cliff" Perez '79; Rev. Dr. Paul M. Barner '82; Andrew Larson '93; and Daquetta P. Jones '02. Cliff Perez had dedicated his life to helping people with disabilities. His passion for advocacy and ensuring equal treatment began when he was a student at Hudson Valley in the late 1970s. The first legally blind student to attend the college, his influence helped bring about the first Office of Disabled Student Services at the college. Today, that office has evolved into the Center for Access and Assistive Technology, which serves more than 650 students with disabilities each semester. Perez went on to earn a degree in social work from SUNY Stony Brook and now works as the systems advocate for the Troy-based Independent Living Center of the Hudson Valley (ILCHV). He fights on behalf of people with disabilities for legislation and awareness on issues including transportation, employment, voting, housing and more. Rev. Dr. Paul Barner was born and raised in Albany. He graduated from Hudson Valley Community College in 1982 with an associate degree in liberal arts and went on to earn a bachelor’s degree in liberal arts/missiology from Nyack College and a master’s degree from Ateneo De Davao University in applied social research: Mindanao studies. Barner started and currently runs an orphanage, school and churches on the southern Philippine island of Mindinao. He, his wife, Elvie, and their children, Timothy and Abigail, travel the world for two months each year searching for sponsors for the more than 4000 poor children who have attended his school, the Barner Christian Academy in Davao City, Mindinao. He plans to open a tribal school in the future to reach poor, illiterate mountain children. Andrew Larson, who was born and raised just a few miles from Hudson Valley’s campus, found his way into the world of television sports production through a job as a golf caddie in South Carolina in 2005. One day, he caddied for some employees of CBS Sports, and they offered him the opportunity of a lifetime: they asked him to join the CBS graphics crew covering the Masters tournament. He went on to cover basketball, tennis, golf, baseball and more. Upon moving back to the Capital District in 2007, he began working in NFL television graphics on CBS, and worked on Super Bowl 50 as part of the production team that took home an Emmy for the broadcast. When a fellow crew member passed away, he helped establish a fundraiser to pay for college textbooks for the man’s daughters. The fundraiser has become an annual tradition, with proceeds going to people in need; a different recipient is chosen each year. Today, Larson resides in Saratoga Springs with his family, owns and operates a bed and breakfast and continues to cover the PGA Tour and NFL for CBS Sports. Daquetta P. Jones is the executive director of YWCA of the Greater Capital Region, Inc. in Troy. A graduate of The Sage Colleges Graduate School of Management, she also has a bachelor’s degree in crime and justice policy from The Sage Colleges of Albany and an associate degree in human services from Hudson Valley, along with more than 16 years of human services experience and 10 years in leadership. YWCA-GCR is one of the area’s largest providers of supportive, affordable and safe permanent and transitional housing to both single women and women with children. The organization is committed to economic empowerment, homelessness prevention, food security services and supportive programs. As the organization’s executive director, Jones is dedicated to eliminating racism, empowering women and promoting peace, justice, freedom and dignity for all. The Distinguished Alumni Awards have been a tradition at Hudson Valley for years. After a few years’ hiatus, they were brought back in 2017, when Mark T. Breslin '58; M. Jeffrey Baker '81; and Rose B. Pascarell '86 were honored. 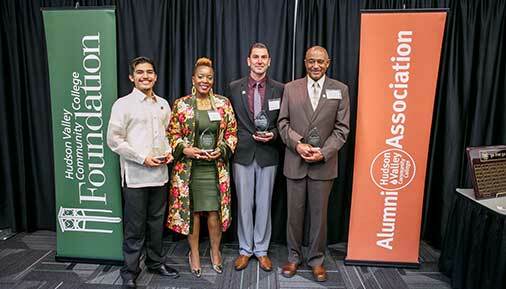 For more information on alumni activities at Hudson Valley, contact the college’s Alumni Association.